Sporty, casual and suitable for all social events of this Summer 2016. 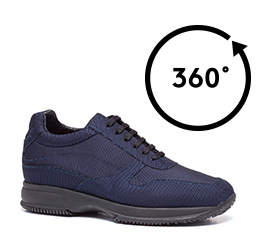 The new elevator sneakers "Taiwan", handmade in Italy, are characterized by the warm color of its upper in blue fabric. The inner lining made of soft goatskin gives optimum comfort allowing the foot to breathe. The insole in genuine Italian leather and the dark gray outsole in lightweight anti-slip rubber of the latest generation, processed by hand, give maximum comfort. The inner increaser can be chosen between 6 cm, 7 cm, 8 cm or 10 cm. A classic look made in Italy that will follow you throughout the summer giving you confidence and style.